Color uplifting depictions of God's creation--from blossoming gardens to smiling children--and vibrant cityscapes, with illustrated scripture and quotes to inspire and encourage. Do you delight in spying cheerful birds outside your window? Are you awed by God's creativity as your eyes scan the fields alongside a road of quiet beauty? If your soul craves more moments like these, you'll experience endless joy through coloring the intricate pictures and illustrated scripture in this book. Excite your creativity by filling in creatively rendered cities, gardens, and seas. Reinvigorate your spirit through the uplifting messages of these pages. As you do, you'll feel happily reminded that God is ever-present and looking out for you, because His love touches everything and everyone. When you think of summer what do you envision? Perhaps flowers, sunrises and sunsets? Or maybe birds soaring across the sky or the way the ray of light hits a stain glass window? 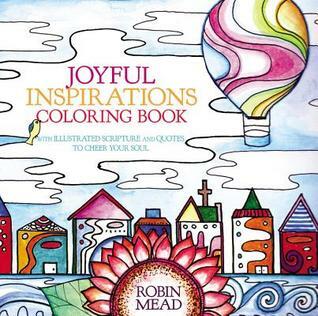 Robin Mead has done a phenomenal job at capturing some beautiful and creative images that allow us to see God's beauty not only in summer, but in the world that we live in through her Joyful Inspirations Coloring Book. There are 96 pages for you to color with several containing passages of scripture that are beautiful and will bring you to a place of peace and calmness. Not only will you feel relaxed, but you will feel close to God as you mediate on His word. I love the idea of being able to slow down and just color through this pages. It reminds us of the beautiful creation and the world that is all around us if we would stop and breath. I recommend that you do not use markers in this coloring book, but rather colored pencils as the markers I have used bleed through. I tend to use the Crayola adjustable Crayons or the prisma colored pencils and did not have issues. I would not use any type of marker as they did bleed through. I give this coloring book a 5/5 star rating. I received Joyful Inspirations Coloring Book from the Publisher. A favorable review was not required.